Shopify is recognized as one of the popular Ecommerce platform among all other platforms available in the market. 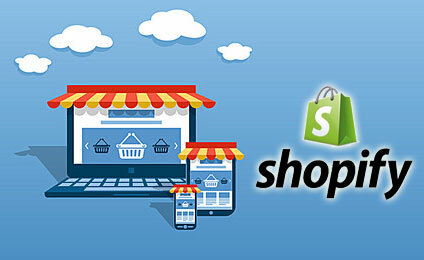 Shopify is an excellent choice for merchants who are looking to promote and sell their products all across the globe. OdiTek Solutions is a leading India based Ecommerce website design & Shopify Development company having highly qualified and experienced team. We are known for world-class Ecommerce website development, stunning quality mobile Apps and websites that deliver the results everyone want. From E-Commerce and custom Web Applications to SEO, we specialize in all aspects of Web Design and Development. OdiTek Solutions’s developers are always technologically updated and deliver the latest demonstrated technology to their clients. Our committed team meets the focused requests of a small or mid-sized business with Shopify’s simplicity and powerful management system. We help to depict the brands and complement with the exceptional offering recommendation to pull in and motivate the customers. Our privileged Shopify development services will support you in managing product inventory and increase business sales conversions. Custom Shopify Development & Solutions: We build custom eCommerce solutions for your business by incorporating all your requirements precisely.Whatever be your requirements, place your trust on us for high-performance custom Shopify development service. Store Development: With experts having over five years experience in the ecommerce industry, your website never lacks any element that helps it reach its maximum potential. Responsive Shopify Development: we offer Responsive Shopify development to help you serve your mobile users better. Shopify Module Development: Build custom modules for your OpenCart online storefront with us and distinguish yourself from the competitors. Site Migration to Shopify Platform: With the help of our skilled professionals, we migrate your present website to robust and feature rich Shopify platform. Shopify Theme Design & Customization: We follow Shopify standards and develop theme from the scratch. We ensure that the theme developed is apt for your e-commerce store and works well on most of the major browsers and any of the mobile devices. We customize the original theme as per your requisites and keep up the standard. Shopify Upgrade and Maintenance: We upgrade your site as and when new versions are released, fix bugs, and render all the essential support for smooth running of the website online throughout its lifetime. Shopify SEO: Though the Shopify platform comes with SEO rich features, we leverage the strategy and help you earn maximum ROI. We help you enhance the store’s SEO to show up on popular search engines like Google and/or Bing. Custom Shopify Extensions Development: We will turn your Shopify website into a feature-packed portal with custom extension development. Shopify App Development: We follow the best practices in bringing your e-commerce site to a wide range of customers. Apps help to engage the customers 24*7*365 from anywhere which accounts for high conversion and ROI. We believe that Shoplift is an excellent platform to establishing your Ecommerce business. As a result, OdiTek offers high quality Shopify edits and customizations, along with an exclusive Shopify theme to give your business the better fell it needs. ShopifyFD- This is one of the most handy tools that we use on a regular basis when working on a Shopify store. ShopifyFD is a bookmarklet that displays hidden Shopify admin features. Beanstalk Shopify Integration- Beanstalk allows you to set notifications, email digests, compare views, and view a detailed history of commits and files. When your theme changes are ready, you can update the themes automatically on every push, or manually after changes have been reviewed. Liquid Cheat Sheet- The backbone of all Shopify Themes is Liquid, a templating language that uses a combination of tags, objects, and filters to load dynamic Shopify content. Timber Framework- Timber is a front-end framework that makes building Shopify Themes quick and easy. Timber’s features can expand using Twigs, a collection of useful assets such as testimonial showcase, password page with countdown, popup AJAX subscribe form, news with feature images and videos, and much more. With our experienced ecommerce experts, your Shopify store will reach record audience boost sales to a whole new level. From concept to deployment, we will take care of it all. So don’t wait to find the right Shopify store yourself, get one custom designed from us now and start selling to the whole world!